The Florida snow ball fight will feature balls made from socks, not snow. The only snow will be in the hearts and minds of the participants and spectators. The Florida snow ball fight will feature “snow balls” made from socks, not snow. The only snow will be in the hearts and minds of the participants and spectators. While there won’t be any actual snow, there will be hot chocolate, popcorn and cookies! There’s no need for children to bundle up as the temperature is expected to be near 70 degrees during the Snow Day event. Bring old (soft) socks to use for snow balls! 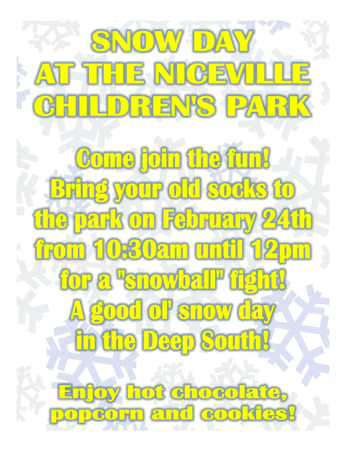 The Niceville Children’s Park is in the City Hall complex, 208 N. Partin Drive.